From childhood, Shay had one dream — to join the Space Corps with her best friend and sweetheart, Jayce. When the Space Corps reveals that the father she thought was dead is actually an infamous pirate and rejects her application, the dream dies and she leaves the planet without saying a word to Jayce. Ten years later, Shay is a pirate herself. She captains her own ship and has earned a reputation as one of the slipperiest pilots around. That's why she's recruited for a dangerous secret government mission. But the cargo she's assigned to smuggle turns out to be a woman with a government bodyguard — Jayce. Jayce never thought he'd see Shay again, and when the mission forces them together on her ship, he isn't sure he can forgive her for deserting him; but their desire for each other is stronger than ever. Jayce knows he wants to be with Shay, but how can he trust a woman who's both a pirate and the girl who broke his heart? 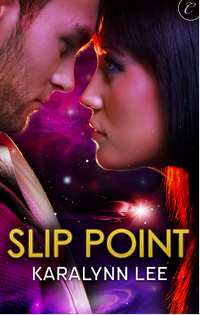 Heather Massey has an interview about Slip Point up at The Galaxy Express. I also wrote a post on the Carina Press blog during the release week on how I came up with the story. And if that isn't enough for you, I've got some author's notes.